This is truly sad, to see people living like this. It is Don and there seem to be more and more every day. okay – you got me. by baragging my senses with scene after scene, I have to recant my earlier comment and confess that I am not immune. I do have tears to shed…. Sorry, my aim is not to cause you distress. I hesitate to ‘like’ this post but I will anyway. It’s incredibly moving and you’ve captured the humanity of these women so well. There’s pity and sadness but also artistry in the images, and that takes some doing. Do these people mind you photographing them? Just wondering… It’s really sad isn’t it. The homeless are among the most generous with their time and their images. I simply approach them, say that I publish a website about Kelowna (my city), and ask if I can take a photo. I’ve never been denied. God bless them. Appreciate your work. I’ve subscribed. Thanks for subscribing and your kind support. Could I ever end up like this??? Could you?? Although it is sad fates you show here – I’m glad you took the pictures and display them. Sometimes pictures tell more than words….. It might not be your goal or intent in causing distress for your readers, but I think we would all do well to allow ourselves the vulnerability of being so touched by your photos that tears come…and to answer Kirsten’s comment if I may, yes, we could become her and them…the surety and steadfastness of all that is normal and good in our lives is but a veil awaiting a strong enough wind…. Thank you for sharing your work and opening our eyes again to that other reality. Hey George, thank you for taking the time to comment. I think you are right, B/W images give a timeless quality and allows the viewer to adapt a more dismissive attitude towards the subject matter. Color on the other hand helps to remind us that the images are a slice of ‘now’ and therefore live in the same time frame as we do. 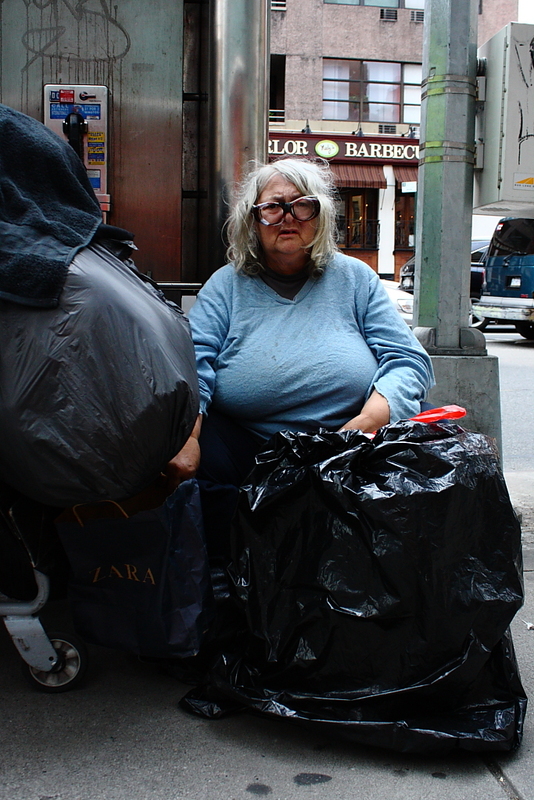 i always say that to myself when i see homeless people…..sister, brother, husband, wife, father, mother? that person once was a child. how did this happen? did they have no family to lean on? i’m blessed i do and i don’t take it for granted. anybody can end up in these peoples shoes. Humans are programmed to ‘carry on’ regardless of the situation they find themselves in. It takes great strength to do that in the face of adversity. To do it alone takes much more than that. Thanks for the comment. You instill an open heart and mind into these images, Anton. And you have named them. We tend to ignore what we don’t understand or want to understand. I think the majority of people view the homeless as a kind of living, breathing street art. A temporary installation, to be walked past, occasionally pointed at and immediately forgotten. Thanks for the comment Karen. Sister? Wife? Mother? Daughter? I often think exactly that when I see a homeless person. I have to wonder what brought them to this. Provocative post. Is it harder to look at a woman in this situation? No, I find it difficult to see any living thing brought down low and in need. It breaks my heart to see a lone wandering dog in the streets too – perhaps, in some ways even more because the animal is totally dependent and lost whereas we as people can reach out to those facilities and agencies that can provide at least temporary shelter and a hot meal. Hi Lynn, I appreciate your comments, perhaps the information below will put it into perspective. 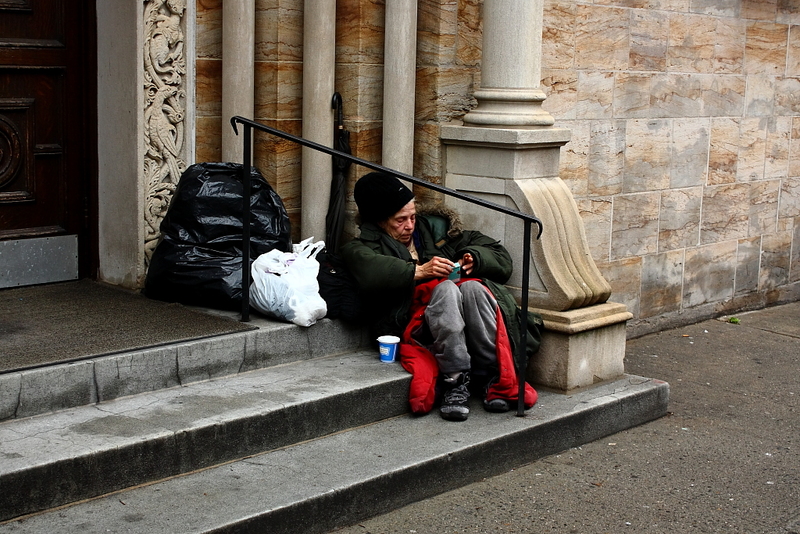 • In recent years, homelessness in New York City has reached the highest levels since the Great Depression of the 1930s. 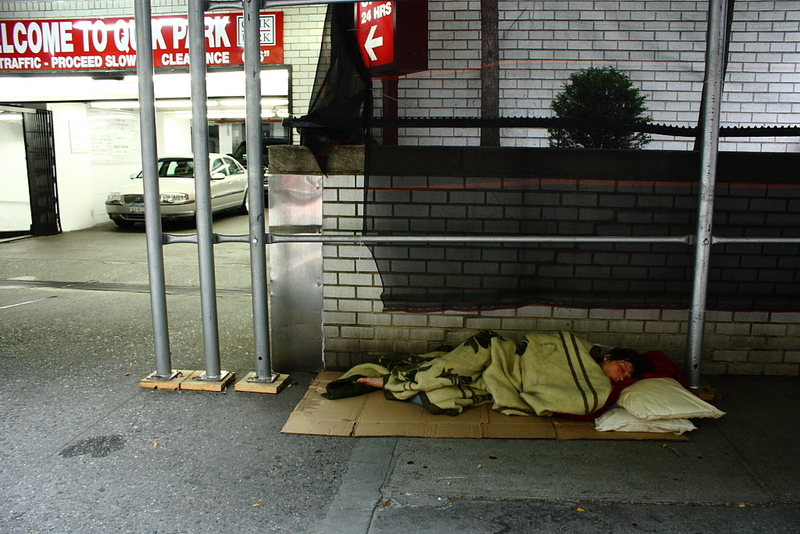 • In April 2012, there were an all-time record 43,000 homeless people, including 10,000 homeless families with 17,200 homeless children, sleeping each night in the New York City municipal shelter system. Families comprise nearly three-quarters of the homeless shelter population. 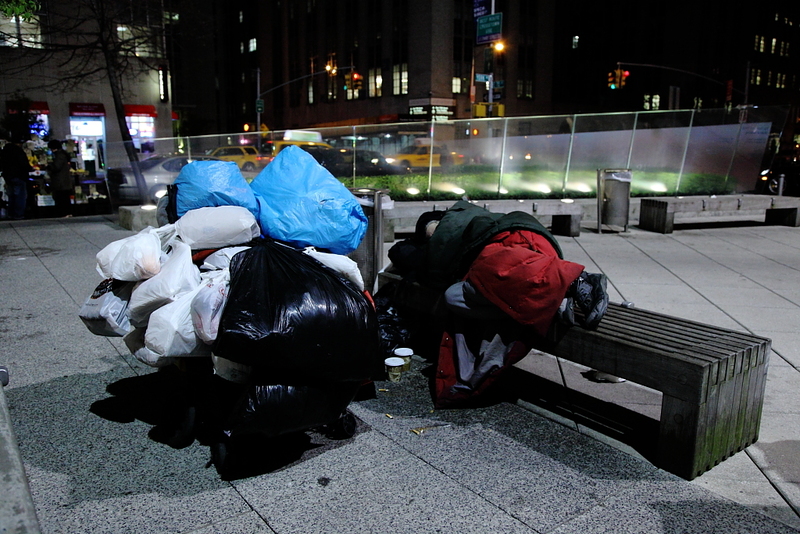 • During the past City fiscal year (FY 2011), nearly 113,000 different homeless men, women, and children slept in the New York City municipal shelter system. This includes more than 40,000 different homeless New York City children. Unfortunately the ‘system’ cannot provide temporary shelter and a hot meal for all of them every day. America! The richest most powerful nation on earth, and thats what most people think. Unfortunately its not quite that simple and in our recent trip we witnessed such scenes at first hand EVERYWHERE in the 14 states. I chose not to photograph any of the people we met, but I talked to them, listened to their stories and tried to figure out how it could all go so wrong. I’m still at a loss to understand. Thanks for the re-blog and the comment. To understand the situation would go some way to begin to fix it. Sadly, I think it will get much worse before that actually happens. I can only talk about New York and that is bad enough, but I know that people are falling below the poverty line throughout the US at an alarming rate. As for the people who are in a position to do something to stop the rot I guess the expression ‘there are non so blind as those that don’t want to see’ is a fitting observation. Interesting discussion and homelessness and increasing poverty have to be documented. But it has no effect if everybody ignore the situation of course. In my country (Scandinavia) we could not take these picture and publish them without asking the people portrayed, since they can be recognized, and even in a humiliating situation. Homeless and beggars or whatever have the same human dignity as others, and regulated by the same (photo) law. It is not my intention to humiliate, degrade or ridicule. I always ask permission when possible, always show respect and consideration and never treat anybody, rich or poor with contempt. Also I would never refer to the people I photograph as ‘beggars or whatever’ if your photo law does not allow this kind of photographic journalism then I would suggest that some of the less fortunate people in Scandinavia will remain under the national radar and therefore not a problem that your government has to deal with. Thanks for the comment. Although photographing the homeless is always a touchy topic, you have photographed these individuals in such a respectful and beautiful way! Great photographs here man!